My quest for a bigger bike took my to the Suzuki dealer in New York City. 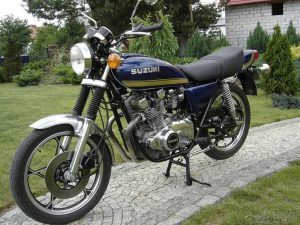 I originally thought that I was going to be bouncing off of sidewalks during my daily commute, but found I just needed a relatively light street bike, so the salesman convinced me to trade my Honda for a new Suzuki GS400. The salesman saw me coming and knew the points I wanted: electric start, front disk brakes, 27 hp, twin cylinder, DOHC, and a digital readout of what gear you were in. So I traded my Honda 250 in for a Suzuki 400. I wanted something faster. I had moved to another office and no longer needed to commute to lower manhattan. That deserved a celebration. I started looking for another bike to suit my new lifestyle.